Buffalo, NY, April 12, 2013 - New York Sea Grant is taking applications for a week-long teacher training cruise on Lake Ontario. The July 7-13 Shipboard and Shoreline Science Workshop takes place aboard the 180-foot EPA Great Lakes National Program Office research vessel the Lake Guardian, docking in Youngstown, NY. The unique learning opportunity for fifteen Grades 4-12 educators and non-formal youth educators teaches them techniques for including Great Lakes science and technology in their classroom curriculum. Participants will combine on-deck activities with classroom development of hands-on learning activities for their students. New York Sea Grant provides post-cruise follow-up assistance to facilitate classroom implementation. Teacher participants receive a stipend to complete a stewardship project with their students. Funding is provided through the Great Lakes Restoration Initiative. Application information is online at www.nyseagrant.org/lakeguardian. Applications will be accepted through April 30. For more information, contact Domske at the NYSG office at the University of Buffalo, 716-645-3610, hmd4@cornell.edu. These annual teaching cruises take place on a different Great Lake each year. 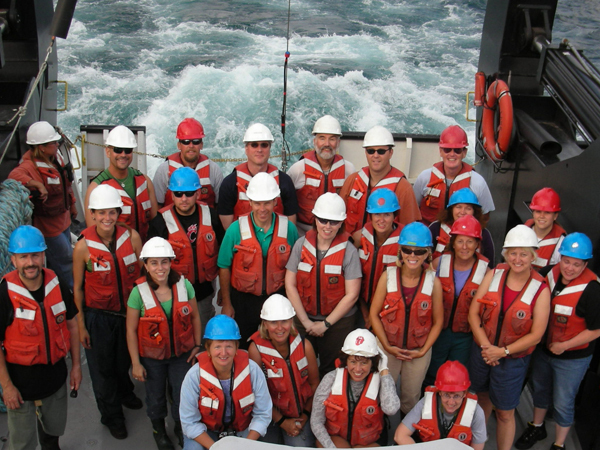 Teachers work alongside the research vessel scientists as they conduct their fieldwork. 2013 areas of study include species at the bottom of the food web, organisms living on the floor of Lake Ontario, and monitoring water quality. This annual teacher training is hosted by the Center for Great Lakes Literacy and coordinated by the Great lakes Sea Grant Network and Great Lakes National Program Office. The 2014 Shipboard and Shoreline Science Workshop will take place on Lake Erie.